The Auto Outings for Bairns were the brainchild of Grand Typhoon Lieutenant-Colonel Patrick Cornelius Saunders O.B.E.. Grand Typhoon Saunders worked for Auto Auctions Limited Horseferry Road, Embankment, London on resigning his commission after a lengthy and distinguished Army career. His concept was to give under priviledged children day trips to the country or seaside to escape the smog of London. Originally enlisting the help of friends at Coombe Wood Golf Club the idea caught on with generous Froth Blowers, who if they did not have a vehicle to use, would rent or hire one for an excursion. The children were said to enjoy the trips tremendously. Of 300 who travelled down to Brighton one summer's day, only 10 had ever seen the sea before. 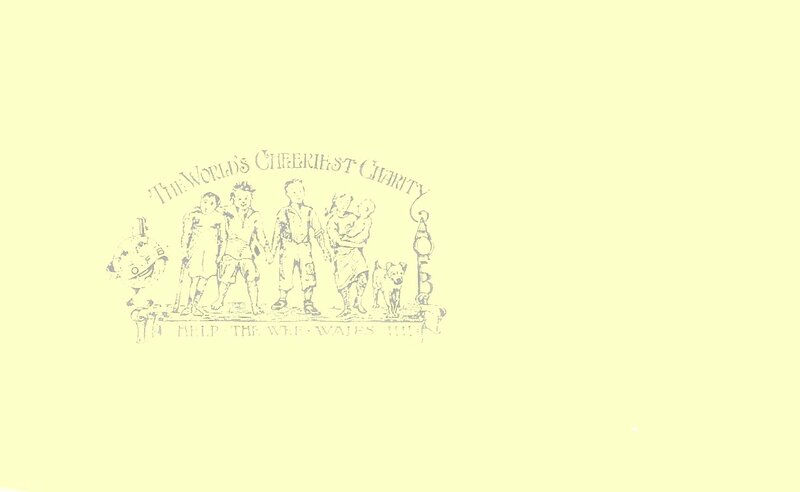 As is only fitting for a group which enjoyed having a good time as much as doing good deeds, the trips to the countryside produced some humorous tales. The Comet of the time reported that while driving past Windsor Castle, one of the children was told it was where the King lived. "Is that so, mister," he replied. "I expect the King has a jolly good mike while he is living down here in that big 'ouse doing nothing." It was explained to the boy that His Majesty did not "mike" a slang term for shirk but worked very hard. stuff while I had a slack down at my 'ouse in Windsor." On another occasion a little girl asked Lt-Col Saunders to play with her while on a trip to Box Hill. "Oh, I am too old now to run about and play," he told the girl. "How old are you really, mister?" queried the little denizen of the slums. "Have you heard of Methuselah?" joked the crafty old Lieutenant Colonel. "No, mister," she replied. "I don't know any of the people living round these parts." Another well documented outing occurred in 1928 when over 200 children were taken on Empire day outing to Maidenhead. The children were taken in 'charabanc convoy' decorated in Union Jacks from various places in London. The coaches were provided by members of the London Stock Exchange arranged by Cloudburst Jack Haes. The convoy stopped off at Coombe Wood Golf Club where the children were each given bags of sweets with some receiving Empire Day medals. The convoy then proceeded on to the Riviera Hotel in Maidenhead with the children waving flags and singing the Froth Blowers Anthem. On arrival they were given an excellent lunch before being taken on a long trip up the river on a large steam launch, loaned by Major Bond for the occasion. Even more remarkable was the fact that five boys between the ages of 12 and 14 later turned up at the Riviera Hotel asking for Monsoon Saunders. They had heard from friends about the outing but were not originally included in the plans so had set out at 07:00 from Shepherds Bush in London and walked all the way to Maidenhead eventually arriving at 16:30. They were all given a really good square meal and were taken back to London later on in the convoy. Shirley Gilbert has provided a newspaper clipping, believed to be from 1925 and from the London Evening Star. The clipping is of some children being taken on an Auto Outing by a member of the A.O.F.B. with the write up of ' Waifs ands strays from Shoreditch were given an outing by road to Brighton by the Ancient Order of Froth Blowers' . 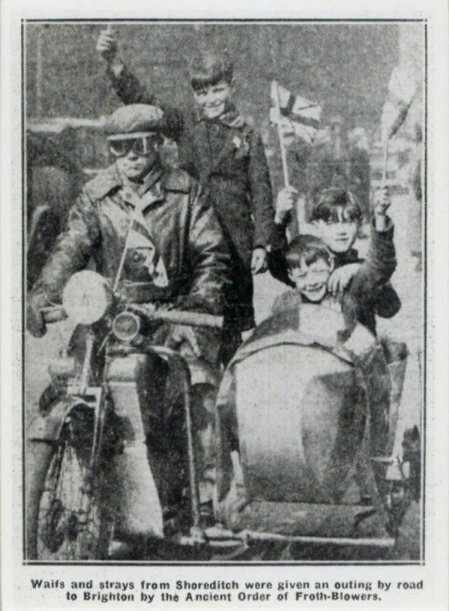 Shirley writes that the boy in the front of the sidecar is her father Patrick Bush, who was actually from West Ham, and that her grandmother was non too enamoured at her son being referred to as a waif and stray.